Seeks to explore the differences between contemporary artworks that use technology to create works of art and artworks of the past. Reference this essay: Swack, Debra. “Cloud Mapping Project (Cloud Room).” In Leonardo Electronic Almanac 22, no. 1, edited by Lanfranco Aceti, Paul Thomas, and Edward Colless. Cambridge, MA: LEA / MIT Press, 2017. Loss of privacy brought on by certain aspects of cloud computing has increased the potential for unauthorized data-mining of our personal information and actively threatened our freedom of expression, along with the dwindling value of personal observation. This has had a direct effect not only upon scientific discovery but also on artistic creation, which is increasingly done using software designed to control the nature of our output. Cloud Mapping Project is a twenty-first-century project that employs remote sensing devices used in scientific applications, such as meteorology and governmental surveillance, to generate artistic images. This is in direct contrast to artists and scientists in the past, whose works were created by their own hand via personal observation. This paper seeks to explore the differences between contemporary artworks that use technology to create works of art (using Cloud Mapping Project as an example) and artworks of the past that were made by individuals who did not employ technologically involved methods, equipment, and processes of any kind. Furthermore, this comparison will utilize the subject of ‘the cloud’ in all its manifestations, from meteorology to computing, as its focus. In the past, all our artistic creations, scientific discoveries, and technological innovations—including the computer—have been designed by individuals. However, this emphasis on human authorship is clearly changing. Intelligent machines are now beginning to design things themselves independent of our input, and additionally can communicate with each other without our guidance. Through our connected devices, machine-learning computers and the ‘Internet of Things’ (a term coined by Cisco Systems) continue to provide us with “a telescope and a microscope into the once invisible world between people, machines, and physical objects.”  Could this not only lead to the obsolescence of individual privacy and personal observation (including those necessary for art making and scientific discovery), but also the obsolescence of the individual all together? How will this development affect personal observation and art making as we increasingly tune out our environment in order to attend to our connected devices instead? As software applications increase in sophistication, complexity, interactivity, and contextual awareness, will software itself generate creative output (that is, art, music, movies, and literature) for us, and will we ourselves lose our urge, curiosity, and ability to create anything of value, in any discipline, without the aid of machines? In Programmed Vision, Wendy Chun states: “software has become a metaphor for the mind, for culture, for ideology, for biology, and for the economy,”  which indicates a growing cultural acceptance of the fact that software is replacing our thinking. The question is: who or what is designing the software, and what are its underlying purposes? Contemporary art installations, like Cloud Mapping Project, are examples of digital-first, machine-generated art in which digitally created tools make digitally created art without human observation or interpretation. These works stand in sharp contrast to past works created by innovators such as John Constable, Alfred Stieglitz, and Claude Debussy, whose non-digital tools did not design nor determine the meanings of their works, but were instead subordinate to the direct observations, analysis, and revelations made by the experienced individuals who guided their use. Supported by personal observations made by individuals who helped construct its meaning in its infancy compared to the complexity of what it means now, this comparison provides historical perspective on the development and meaning of ‘the cloud,’ as it relates to both the arts and technology (including painting, photography, music, meteorology, and computer-generated design). The metaphor of the hierarchical structures of ‘the cloud’ has its origins in weather. As most clouds form at specific altitudes, particular weather conditions determine their structural shapes. Over 200 years ago, the British chemist Luke Howard first defined (and illustrated through watercolor sketches) the four main cloud structures that are still in use today: cumulus /heap, stratus /layer, cirrus /curl, and nimbus /rain. While Howard’s preliminary research exposed the relationship between different atmospheric conditions and defined the basic cloud structures, twenty-first-century art projects, like Cloud Mapping Project, incorporate modern meteorological methods that can also introduce surveillance and data-mining capabilities by using Radar, LiDAR, satellites, and Self-Organizing Maps (neural networks that use pattern recognition, clustering and that can improve their performance through machine learning) used to produce high-resolution maps and to classify climate and clouds. Digital remote sensing is used for a variety of applications including meteorology, mapping, news analysis, illustration, and military surveillance. It allows us to observe the environment or a situation from afar by analyzing specific, measurable information and presenting it in visual and/or acoustic format. Even though this approach is done remotely, it is not entirely unlike Howard’s writings and watercolor representations of cloud structures and meteorological conditions (made through direct observation), which resemble weather forecasting, albeit on an infinitely smaller scale, using the tools of the day. Contemporary weather forecasters use techniques that collect quantitative data about the current state of the atmosphere which in turn help educate their predictions. Some of Constable’s paintings from over 200 years ago so accurately represented weather conditions that they can be considered the predecessors of such weather forecasting and meteorological mapping techniques. In Cloud Mapping Project (Cloud Room), three-dimensional cloud images are downloaded via Google Earth or other open-source applications in real-time, located by x, y, and z latitude and longitude coordinates. Cloud structures form at different altitudes and positions in the sky, so this is an aesthetic as well as a scientific and cartographic decision. Each of the four walls simulate the earth’s globe in 3D by continually posting computer-generated surveillance—like picturesque cloud images from a specific direction/location (north, south, east, or west) as day turns into night around the world (figure 1). Figure 1. 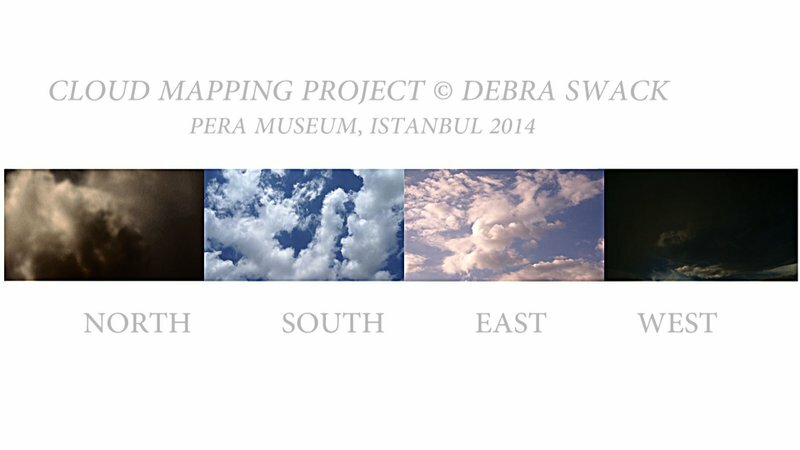 Debra Swack, Cloud Mapping Project, 2014. Multimedia immersive installation, schematic view. © Debra Swack, 2014. Courtesy of the artist. 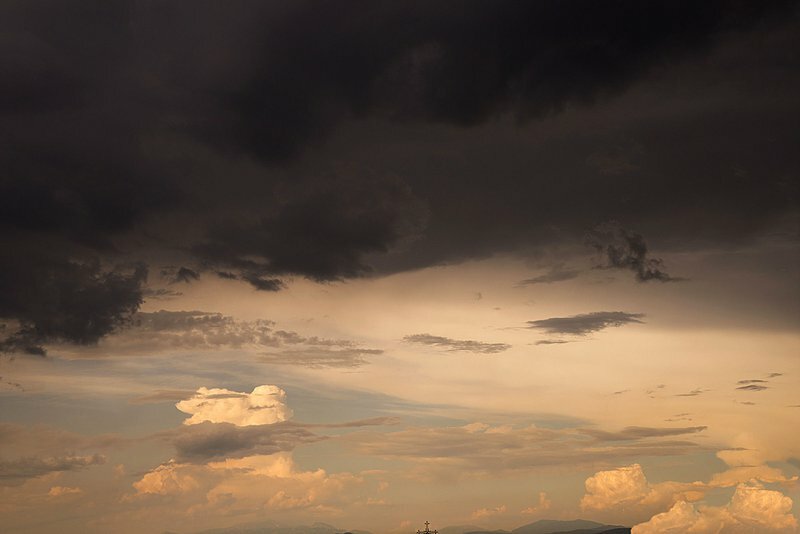 It will incorporate an atmospheric, binaural soundscape incorporating field recordings of weather, and possibly will use specialized eyeglasses incorporating Tobii Eye Tracking or other technologies to enable viewers to manipulate cloud images with their eyes. While Howard and Constable opted for scientific clarity in their representation of the hierarchal structure of clouds in the beginning of the nineteenth century, by its end, artistic representation of the cloud took an impressionistic turn toward abstraction. For example, in the late-nineteenth century, French composer Claude Debussy was influenced by paintings of the 1870s, such as Nocturne in Blue and Silver by James Abbott McNeill Whistler. He applied these impressionistic principals to his depictions of clouds in his musical composition, titled Nocturnes, which he completed in 1899. This hazy concept of clouds allowed for greater variability and movement in its representation of atmospheric conditions by capitalizing upon the vague, rapid comings and goings of events and sounds. Yet, at the same time, Debussy (and Whistler) were trying to capture the feeling of the ‘whole’ or the ‘essence’ at any given time. This view allowed for more complex and dynamic events to occur simultaneously, and for these to be acoustically and visually represented; however, the view of the ‘whole’ tended to diminish any individual details, which were never retrievable and were themselves continually in a state of flux. Debussy described the atmospheric effects in Nocturnes as transitioning from periods of stability, as reflected by “the unchanging sky and the slow, solemn movement of the clouds dissolving in grey tints lightly touched with white,” to periods of volatility caused by the “restless, dancing rhythm of the atmosphere interspersed with sudden flashes of light.”  The realism of his sound is akin to binaural field recordings (discovered about twenty years prior to the completion of Nocturnes), such as those of weather and wind chimes used in Cloud Mapping Project. 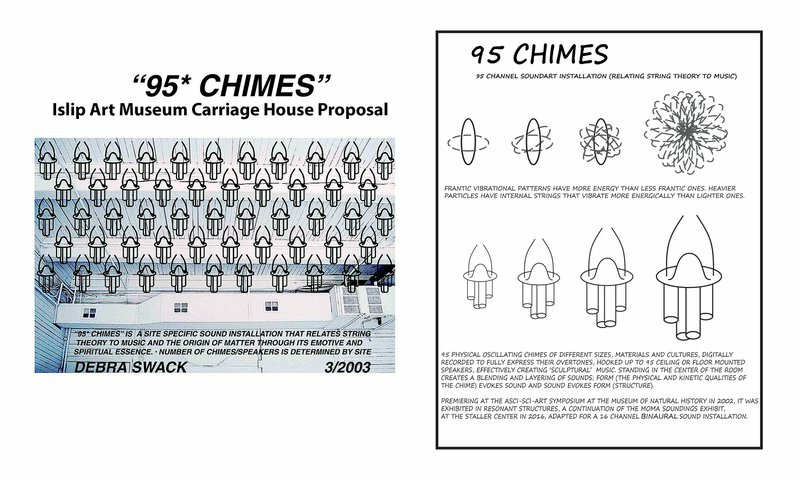 Cloud Mapping Project’s soundscape is based on 95 Chimes, an immersive, sculptural-sound art installation using binaural recordings of wind chimes that was first presented at the ASCI Sci-Art Symposium at the Museum of Natural History in 2002 (figure 2). Figure 2. Debra Swack, 95 Chimes, sound-art installation schematic, adapted for the ceiling of the Islip Art Museum. © Debra Swack, 2002. Courtesy of the artist. Binaural recordings can convincingly replicate a sound’s location by taking advantage of the fact that we are capable of locating sounds in three-dimensional space and perceiving their proximity to us (including their distance and direction). Binaural recordings can also provide a wealth of information for surveillance tracking, including temporal data. Additionally, the construction of Nocturnes is prescient of the augmented reality used within the cloud today, blending the virtual with the real and intertwining the throughput of actual events, data, and computer-generated information presented in a perpetual stream. Debussy’s dizzying view of clouds and their perpetual activity can serve as a metaphor for the complicated issues surrounding privacy and security: where is all this audiovisual data—consisting of imaginary displays “mingling with the aerial revelry” amongst a background of music that blends with the “luminous dust participating the universal rhythm of all things” —coming from, and where is it going? The fact of the matter is that the legal system itself is having difficulty enacting laws that keep pace with technology, and what is legal in one country may not be legal in another. This all adds to the nebulousness of the cloud. At the beginning of the twentieth century, the depiction of clouds reverted to the scientific view first espoused by Luke Howard and John Constable. But this time, the representation was a little different, as it encompassed the use of a machine—a camera—in order to make images. Throughout the nineteenth century, photography was not considered an art form, but rather a means to scientifically document information. The camera was considered a machine and, therefore, incapable of making art. Starting in 1902, the photographer Alfred Stieglitz, by promoting the activities of his Photo Secession group, Camerawork, through publications and exhibitions, was able to help establish photography as an art medium on par with painting. In his Equivalents series, Stieglitz’s innovative approach to photographing clouds through personal observation was scientific, not impressionistic like Debussy’s. While Debussy aimed at depicting a zoomed-out worldview snapshots of events, Stieglitz’s view was zoomed-in and detailed, a perspective that was embraced by many artists and photographers at the time as being more objective and scientific. What is interesting is that, though he was aware of both macro and micro views, having stated that he was interested in depicting both “clouds and their relationship with the world” and “clouds for themselves,” he ultimately decided to depict only the latter; that is, to provide a micro view. It is also interesting that, while the technology for satellite photography was not available until 1960, aerial black and white photography had been used for military surveillance since World War I (and is still used for surveillance now). Perhaps Stieglitz did not want to convey any military association. Her statement further demonstrates this growing awareness of the macro/micro view of the world that was a precedent for the digital age and observations of its corresponding data. In contemporary times, almost one hundred years after Stieglitz’s Equivalents was created in the 1920s, our technology (even our cell phones) allows us easy access to, and the flexibility to alternate instantaneously between, these views by connecting us to applications on the internet. Additionally, we are able to distinguish and value the particular information that each view affords while always remaining cognizant of the other. While Stieglitz used his camera to create micro views through personal observation, Cloud Mapping Project uses remote sensing devices to digitally capture macro views of live weather satellite imagery, without the aid of personal observation and interpretation. The intention is to display completely machine-generated, picturesque cloud images (figure 3) reminiscent of painting or impressionist photography, yet independent of human interpretation. Figure 3. Debra Swack, Cloud Mapping Project, 2014. Multi-media immersive installation, detail view. © Debra Swack, 2014. Courtesy of the artist. As with the camera, first conceived of as a mere machine, incapable of elevating photography to an art form until the beginning of the twentieth century, we are now entering a new but similar phase in our engagement with digital machines in the twenty-first century. Even though these machines should function as tools like the camera, we do not completely understand or trust their capabilities. Software was once designed by individuals, but increasingly it is being designed by, and sometimes for, other telemetry tools (that is, other machines). Along with advances in technology that have benefited us—improvements in weather forecasting, Google mapping applications that provide us with satellite images, GPS capabilities to locate streets and drive our cars, AI-enabled devices that think independently of us and create not only art but 3-D bio-printing—come reservations regarding the unauthorized use of these tools. Stieglitz, Constable, Debussy, and Howard provided alternative conceptual views of clouds using personal observation, views that form the basis for ‘the cloud’ today. Howard and Constable provided representations of the cloud that were hierarchical, structural, graphic, and meteorologically accurate (clouds generally form at different altitudes depending on their characteristics and environmental conditions). Debussy provided a macro input/output moving cloud complete with acoustic properties, while Stieglitz provided a machine-aided micro cloud using his camera. In Constable’s time, tools were always subordinate to the mind of the individual using them; now, as software is becoming a substitute for the mind, who can say what these tools will do? Samuel Greengard, The Internet of Things (Cambridge, MA: MIT Press, 2015), XIV. ABI Research, “Internet of Things vs. Internet of Everything,” (Oyster Bay, NY, 2014), 5. Wendy Hui Kyong Chun, Programmed Vision (Cambridge, MA: MIT Press, 2011), 2. Samuel Greengard, The Internet of Things (Cambridge, MA: MIT Press, 2015), 158. Luke Howard, On the Modifications of Clouds, Third Edition, eds. W. Dillworth Howard and Eliot Howard (London: John Churchill and Sons, 1864), 2. Robert A. Schowengerdt, Remote Sensing: Models and Methods for Image Processing(Burlington, MA: Academic Press/ Elsevier, 2007), 2. John Thornes, “Constable’s Meteorological Understanding and his Painting of Skies,” in Constables Clouds, ed. Edward Morris (EdinburghScotland: National Galleries of Scotland / National Museums and Galleries on Merseyside, 2000), 159. Samuel Greengard, The Internet of Things (Cambridge, MA: MIT Press, 2015), 161. Louise Liebich, Claude-Achilles Debussy: Living Masters of Music, ed. Rosa Newmarch, (London and New York: John Lane Company, 1908), 42. Frances Dyson, The Tone of our Times: Sounds, Sense, Economy and Ecology(Cambridge, MA: MIT Press, 2014), 14. Samuel Greengard, The Internet of Things (Cambridge, MA: MIT Press, 2015), 163. Alfred Stieglitz, “How I Came to Photograph Clouds,” in The Amateur Photographer & Photography 56, no. 1819 (1923): 255. Wendy Hui Kyong Chun, Programmed Vision (Cambridge, MA: MIT Press, 2011), 9. Debra Swack is a Fulbright Specialist and Phi Theta Kappa in computer science who began exhibiting new media and sound art in the early 90s at Xerox Parc while doing software testing and technical writing for PolyGram Records/Universal Music Group. She is mentioned in Art and Innovation at Xerox Parc, published by MIT in 1999, and works with immersive and interactive environments. Her last article on The Emotions after Charles Darwin, a project exploring the universality of emotions on a biological level, regardless of cultural classifications such as race or gender, and conducted collaboratively with international neuroscientists to aid in autism research, was published by Leonardo Electronic Almanac.